The use of coaxial cable transmission lines for RF, microwave, millimeter-wave, high-speed digital, and other critical communications is a growing trend in military, aerospace, and high-risk industrial applications. Though the need for robust communication technology is substantial for these applications, the latest budgets and production cycles are often too small and too short to be effectively accommodated by the outmoded acquisition method of most high-reliability (Hi-Rel) coaxial cable assembly manufacturers. As a consequence, primes and OEMs are turning toward commercial-off-the-shelf (COTS) solutions. Though COTS products may be available on time, they also introduce a significant reliability and traceability concern for systems integrated and used for mission-critical applications. Fortunately, there are COTS cable assembly solutions available, built for Hi-Rel applications with certifications and traceability included. Unfortunately, there are also a variety of misleading designations and descriptions surrounding coaxial cable assemblies that could lead to accidental sourcing of under-specified cable assemblies. Hence, there are test, traceability, and facility qualifications that ensure a cable meets the Mil-Spec/Hi-Rel specifications. Coaxial cable assemblies, in various lengths, are used in virtually all RF/microwave applications, and increasingly with high-speed digital and other robust communication technologies. The demand for high reliability (Hi-Rel) is also increasing with the growing adoption of coaxial transmission lines in more military/aerospace applications, along with additional industrial use cases. For mission-critical applications, it is essential that coaxial cable assemblies that meet strict reliability standards are used, which has become a challenge when sourcing cable assemblies due to the wide range of designations and cable descriptions commonly applied [1,2]. Many of these designations and descriptions are either traditional, application specific, are “marketing” terminology, and can be misleading for professionals sourcing cable assemblies with specified reliability. An important note is on the varied use and applicability of the so-called “RG” rated cables. The use of the term RG, which originally stood for Radio Guide, originated with a World War II military standard, MIL-HDBK-216 published in 1962 . It has been outdated and withdrawn for many decades, but there are still plenty of RG cables being manufactured today. What is significant about this, is that the RG designations no longer have a specification, and thus, do not actually describe the geometries, performance, or reliability of the cables. However, some industries still used the RG designation, along with the numbers and specific Universal (U) designation for coaxial cable assembly that are designed to be compatible with the inner conductor, dielectric, jacket, and connector dimensions. There are several specifications and designations that can be applied to coaxial cable assembly components and to the assembly as a whole. “In addition to mechanical and environmental requirements, military standards exist for electrical specifications such as radio-frequency (RF) leakage, and power usage on the cable.” shares Michael Rachlin, CTO of Pasternack. It is important to understand the specifications and designations prior to sourcing cables, as they could have significant, and unpredictable, implications depending on the application and environment the cables are deployed in. Which is why merely buying “RG” or “Hi-Rel” coaxial cable assemblies could result in untold future system reliability issues and costs. Moreover, even with cable assemblies designated to meet Mil-Spec, the assemblies may not be qualified, tested, or inspected in a manner consistent with the Mil-Specs. 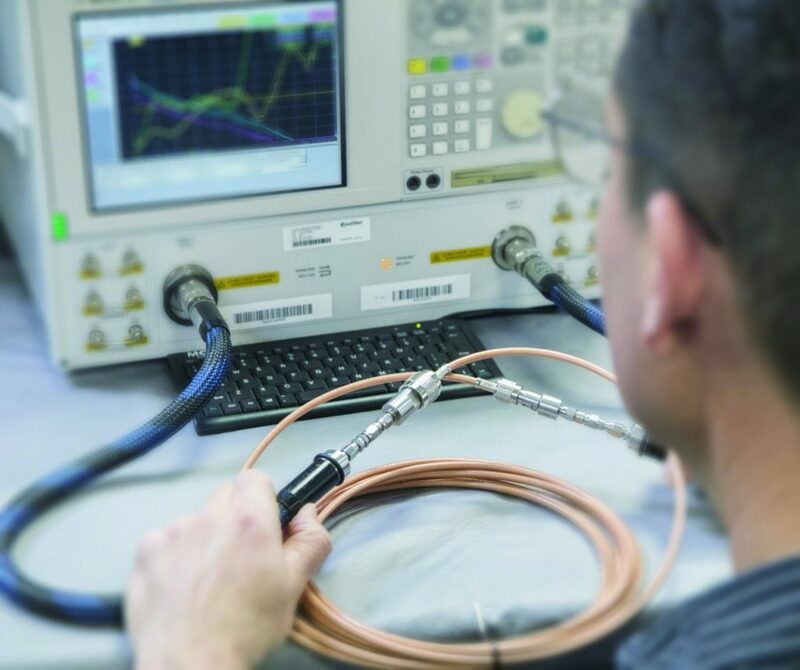 This article will illuminate several of the key Mil-Spec electrical and RF tests important to Hi-Rel coaxial cable assemblies, and also provide details around sourcing assemblies that ensure specified levels of reliability. There are several key Mil-Specs that define coaxial cables, connectors, and complete assemblies for military applications, as well as additional Mil-Spec for aerospace applications. MIL-DTL-17 and MIL-PRF-39012 are the key Mil-Specs that detail the electrical testing for coaxial cables and connectors, while MIL-DTL-87104 specified tests and requirements for coaxial cable assemblies [4,5,6]. Furthermore, there is an airborne system specification, MIL-T-81490, which includes transmission line specifications for airborne systems . The requirement for a coaxial cable assembly to be compliant with a particular specification depends on the needs of a specific end-application, though MIL-DTL-17 and MIL-PRF-39012 cable and connector tests address the needs of a wide range of end uses and a diverse set of environments. The Mil-Spec tests are divided into several categories, including testing materials, qualifying testing, conformance testing, and inspection testing. Once a product and production system is qualified, conformance and inspection testing is performed on lots and on each cable unit. 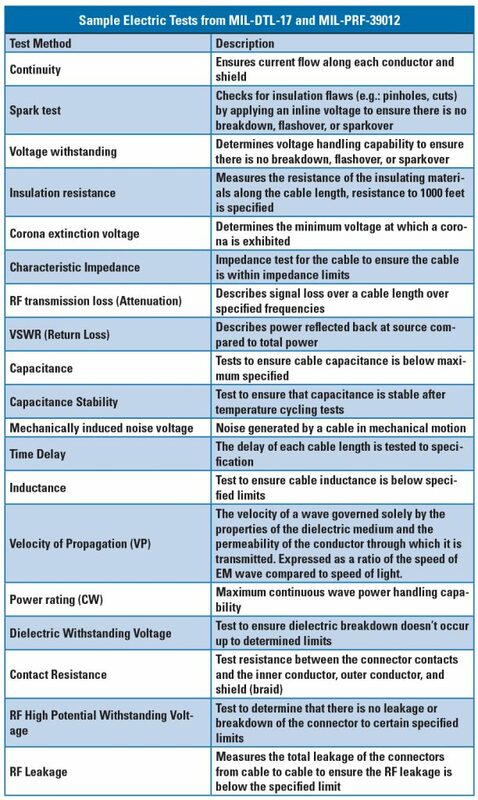 The RF and electrical tests in Table 1 are used for each category of test, and the following test descriptions discuss qualification test methods, as well as how these tests can be performed on coaxial cable assemblies during production. This test is a general test for military grade electrical components to ensure that the “strength” of the insulation is adequate to allow for normal operation and can survive occasional overpotentials from switching, surges, or other transient phenomena . Hence, the dielectric withstanding voltage test is performed over a specified period of time between the center conductor and outer conductor of a coaxial connector. The test is performed using a high voltage source, voltage measuring device, leakage current measuring device, and a fault detector. The test involves raising the voltage at a uniform rate for a duration of 60 seconds, though various rates, voltage levels, and timing can be specified. This same test can be performed as lot inspections during production to ensure the process and materials conform to specification. The insertion loss of a connector is tested using a connector pair across a cable, which includes the reflection losses to the cable and the dissipating losses within the pair of connectors. A tuner is used to tune out the input VSWR of the setup, so that only the insertion loss factors are measured in the final test. With cable assemblies, a similar test is performed to gauge the total insertion loss of a cable length to ensure the total insertion loss is less than the sum of the specifications of each connector and the cable. For production testing, this test is often performed with a network analyzer along with VSWR testing. VSWR tests are performed using a Vector Network Analyzer (VNA) with full 12 term error correction and the appropriate calibration standards. The test requires a test connector to be attached to a cable and with the end terminated in an appropriate load—the characteristic impedance of the connector. For a cable assembly, a similar test can be performed to ensure the signal reflected back from a connector is below a maximum ratio specified. Poor VSWR ratios, or mismatch, occurs as a result of impedance mismatch between the connectors and cable, as well as with workmanship/fitment issues with the contacts, center conductors, shielding (braid), and insulators. The characteristic impedance test for a cable and connector assembly is done not only at the ports, but also along the entire length of the cable assembly using time domain reflectometry (TDR). A precision air-line transmission line is used as a control for the TDR impedance test, and is connected inline to the cable assembly during testing. The performance of the cable assembly is compared to the airline from either end during qualification. For final inspection testing, a TDR is also used to determine that the characteristic impedance is within a certain specified range around the ideal impedance, typically 50 Ohms or 75 Ohms. The insulation resistance of a connector or cable is tested with a voltage applied from the center conductor to the outer conductor, with the outer conductor being held at ground potential. The test is normalized over 1000 feet, for which the specification limits are determined. A similar test is performed for a cable assembly to ensure the insulation resistance is above a specified minimum limit. As every engineer should know, specification sheets don’t tell the whole story. Also, when troubleshooting design or production problems, it is valuable to have reference test information on the components in order to track down failures and anomalous performance issues. Having RF test plots for each coaxial cable assembly aids manufacturers in maintaining a high level of quality control. Aside from electrical specifications, there are several critical mechanical specifications for coaxial cable and connectors. As the connectors are the crucial element for compatibility and interoperability with existing and future Hi-Rel systems, MIL-STD-348 is an important specification that ensures commonality of RF connector dimensions and tolerances. Within MIL-STD-348 is the specification for coaxial connectors commonly used in commercial, industrial, military, and aerospace applications. For example, BNC, N, TNC, SMA, SMB, SMC, SMP, SSMP, SOP, OSSP, OSMM, SSMA, SC, QMA, UMCC, SSMT, and MMCX, are all geometrically described in MIL-STD-348. If coaxial connectors don’t meet MIL-STD-348, they may not be able to thread, or press-fit, with other RF assemblies or connectors, and could even degrade performance or damage the ports the non-compliant connectors are being fitted to. Moreover, non-compliant connectors may not allow for proper fitting with Mil-Spec coaxial cable center conductors, outer braiding, or jacketing, which would also lead to degraded or destructive operation. A significant aspect of this is traceability of components to their original manufacturing and material sources. Commonly known as Lot Traceability, as components and materials are typically sourced in lots, this helps to ensure that the materials and construction of a lot of product are compliant, and if failures do occur, the root cause can be tracked down to the source. Without Lot Traceability, systematic or sourcing failures may not be able to be identified and every unit produced by a manufacturer or material source could be suspect. Testing and traceability are essential in maintaining adequate quality control to safeguard against using unreliable coaxial cable assemblies for critical applications. Outside of conformance to military standards, and industrial standards derived from military standards, there few ways to be confident a coaxial cable assembly will meet any reliability expectations. Sourcing Mil-Spec cable assemblies and COTS components is often difficult for this very reasons, and sourcing from suppliers and facilities that meet military qualification standards is likely the only way to avoid cable assembly mishaps and the cost of critical system failure.